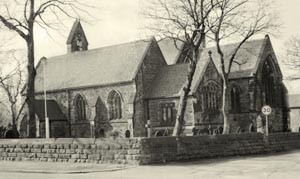 On Tuesday 20th October 1857, Robert Bickersteth the Lord Bishop of Ripon laid the first stone of a new church at Outwood, which is about to be built with subscriptions from the inhabitants. The church is to be called, The Church of St Mary Magdalene. His lordship arrived at Springfield House (Lofthouse Station) by the Leeds, Wakefield and Bradford Railway, at about 11am, the train by courtesy of the directors, making a special stop for his lordships convenience. A little before 11 o’clock the children and teachers of Stanley School, in a long procession, marched up to the field in which the stone was to be laid, and shortly after them another procession followed, consisting of laity and clergy in their surplices, the Bishop of the Diocese with his chaplain (the Rev C. J. Camidge) and the Rural Dean of Wakefield bringing up the rear. The service was then commenced by the Bishop. The choir of Stanley Church assisted by the clergy and others, gave the responses in a solemn and most appropriate manner. The Psalms were sung to Purcell’s chant in G and a Gregorian tone. As soon as the stone had been blessed and laid by the Bishop and before the usual service was ended, his lordship delivered a most feeling and appropriate address, wherein he explained why the first stones of churches were laid with prayer and religious service. His lordship concluded by urging the people of the district to avail themselves of the privileges about to be offered unto them The service ended the procession of clergy once reformed, preceded the bishop to the place of unrobing. The church will be built after plans furnished by W.H. Dykes Esq., of York, with nave, north aisle , chancel, organ, chapel and vestry and will seat 400 persons. A south aisle with tower and spire will be added, when more room is required and sufficient funds are raised. The church is to serve for a new district to be taken from the present Parish of Stanley. This new district now contains 2,300 persons, mostly miners who are scattered over an area of 1,800 acres. 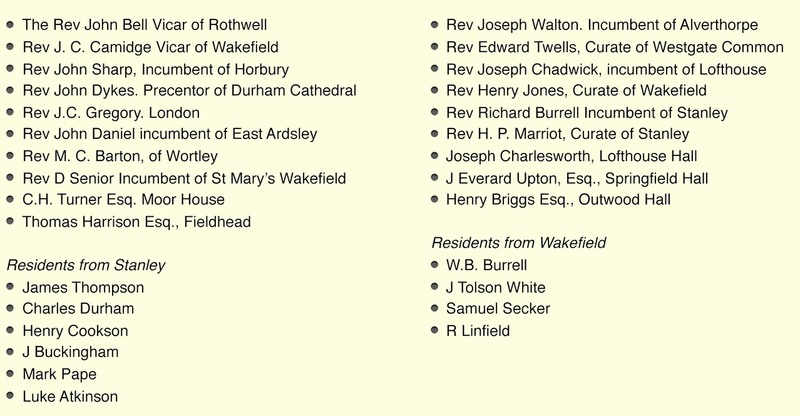 After the conclusion of the ceremony, his lordship and suite, proceeded to Springfield House the residence of Mr Upton, by whom they were entertained at luncheon, after which his lordship visited Wakefield, where he administered the rite of confirmation. Normally, a Vip of the organization, or a local celebrity or community leader will be invited to conduct the ceremony of figuratively beginning the foundations of the building, with the person's name and official position and the date usually being recorded on the stone. This person is usually asked to place their hand on the stone or otherwise signify its laying.